Iranian-Armenians (Armenian: իրանահայեր iranahayer or Armenian: պարսկահայեր parskahayer, "Persian Armenians"), are ethnic Armenian citizens of Iran. They are mostly concentrated in Tabriz, Tehran and Isfahan's Jolfa (Nor Jugha) quarter, and an estimated 70,000 to 200,000 remain in the country. The Armenians have a many millennia old history within the modern-day borders of Iran. They are amongst the native inhabitants of Iran's northwestern regions, with the territory having made up part of historical Armenia numerous times in history. 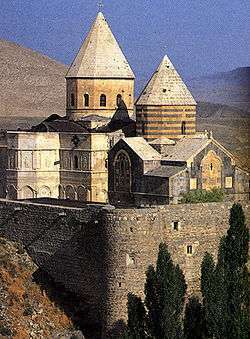 Many of the oldest Armenian churches, monasteries, and chapels, are located within modern-day Iran. Persian Armenia, which includes the modern-day Armenian Republic was part of Qajar Iran up to 1828, and Iran had one of the largest populations of Armenians in the world alongside neighboring Ottoman Empire until the beginning of the 20th century. Iranian-Armenians were very influential and active in the modernization of Iran during the 19th and 20th centuries. After the Iranian Revolution, many Armenians emigrated to Armenian diasporic communities in North America and Western Europe. Today the Armenians are Iran's largest Christian religious minority. It is commonly noted that, due to their migration to the Persian Empire many centuries ago and being native to northwestern Iran, Armenians of Iran have culturally assimilated with their Muslim Iranian compatriots in a very noticeable way and have adopted a number of their traditions while simultaneously keeping their Christian faith and Armenian identity. Since Antiquity there has always been much interaction between Ancient Armenia and Persia (Iran). The Armenian people are amongst the native ethnic groups of northwestern Iran (known as Iranian Azerbaijan), having millennia long recorded history there while the region (or parts of it) have had made up part of historical Armenia numerous times in history. These historical Armenian regions that nowadays include Iranian Azerbaijan are Nor Shirakan, Vaspurakan, and Paytakaran. Many of the oldest Armenian chapels, monasteries and churches in the world are located within this region of Iran. On the Behistun inscription of 515 BC, Darius the Great indirectly confirmed that Urartu and Armenia are synonymous when describing his conquests. Armenia became a satrap of the Persian Empire for a long period of time. Regardless, relations between Armenians and Persians were cordial. In the 11th century, the Seljuk Turks drove thousands of Armenians to Iranian Azerbaijan, where some were sold as slaves and others worked as artisans and merchants. After the Mongol conquest of Iran in the 13th century many Armenian merchants and artists settled in Iran, in cities that were once part of historic Armenia such as Khoy, Maku, Maragheh, Urmia, and especially Tabriz. Although Armenians have a long history of interaction and settlement with Persia/Iran and within the modern-day borders of the nation, Iran's Armenian community emerged under the Safavids. In the 16th century, the Ottoman Empire and Safavid Iran divided Armenia. From the early 16th century, both Western Armenia and Eastern Armenia fell under Iranian Safavid rule. Owing to the century long Turco-Iranian geo-political rivalry that would last in Western Asia, significant parts of the region were frequently fought over between the two rivalling empires. From the mid 16th century with the Peace of Amasya, and decisively from the first half of the 17th century with the Treaty of Zuhab until the first half of the 19th century, Eastern Armenia was ruled by the successive Iranian Safavid, Afsharid and Qajar empires, while Western Armenia remained under Ottoman rule. From 1604 Abbas I of Iran implemented a "scorched earth" policy in the region to protect his north-western frontier against any invading Ottoman forces, a policy which involved a forced resettlement of masses of Armenians outside of their homelands. Shah Abbas relocated an estimated 500,000 Armenians from his Armenian lands, during the Ottoman-Safavid War of 1603-1618, to an area of Isfahan called New Julfa and the villages surrounding Isfahan in the early 17th century, which was created to become an Armenian quarter. Iran quickly recognized the Armenians' dexterity in commerce. The community became active in the cultural and economic development of Iran. Bourvari (Armenian: Բուրւարի) is a collection of villages in Iran, between the city of Khomein (Markazi Province) and Aligoodarz (Lorestān Province). It was mainly populated by Armenians who were forcibly deported to the region by Shah Abbas of the Safavid Persian Empire during the same as part of Abbas's massive scorched earth resettlement policies within the empire. The following villages populated by the Armenians in Bourvari were: Dehno, Khorzend, Farajabad, Bahmanabad and Sangesfid. With increasing encroachments of the expanding neighbouring Russian empire towards the south at the expense of Qajar Iran and Ottoman Turkey, in the course of the 19th century Qajar Iran would lose all its integral territories in the Caucasus region through the Russo-Persian Wars to Russia. This included the irrevocable loss of Eastern Armenia (roughly equivalent with modern-day Armenia) in 1828 per the Treaty of Turkmenchay. From 1795 to 1804 during the earliest clashes leading up to the 19th century wars between the Russian and Persian Empire Armenians were taken as captive in Iran. There were also 20,000 Armenians who moved for Georgia. Following the results of the Russo-Persian War (1804-1813), Qajar Iran was forced to irrevocably cede swaths of its territories in the Caucasus, comprising modern-day Georgia, Dagestan, and most of the Republic of Azerbaijan. The Russo-Persian War (1826-1828) that followed afterwards forced Qajar Iran to irrevocably the complete remainder of its Caucasian territories, comprising modern-day Armenia and the remainder of the Azerbaijan Republic. All abovementioned territories, which had made part of the concept of Iran for centuries, were ceded to Imperial Russia as confirmed by the 1813 Treaty of Gulistan and 1828 Treaty of Turkmenchay, respectively. The ceding of what is modern-day Armenia (Eastern Armenia in general) in 1828 resulted in a very large amount of Armenians falling now under the rule of the Russians. As a result, an estimated 40,000 Armenian refugees from Persia returned to the territory of the Erivan khanates after 1828, while about 35,000 Muslims (Persians, Turkic groups, Kurds, Lezgis, etc.) out total population of over 100,000 left the region, many going to the newly established borders of Qajar Iran. With these events of the first half of the 19th century, and the end of centuries of Iranian rule over Eastern Armenia, a new era had started for the Armenians within the newly established shrunk borders of Iran. The Armenians in the recently lost territories north of the Aras river as a result of the Russian conquests now would go through a Russian dominated period, until 1991. Vank Cathedral in the New Julfa district of Isfahan. one of the oldest Iran's Armenian churches that build during Safavid Persian Empire, 1655 - 1664. The Armenians played a significant role in the development of 20th-century Iran, regarding both its economical as well as its cultural configuration. They were pioneers in photography, theater, and the film industry, and also played a very pivotal role in Iranian political affairs. The Revolution of 1905 in Russia had a major effect on northern Iran and, in 1906, Iranian liberals and revolutionaries, demanded a constitution in Iran. In 1909 the revolutionaries forced the crown to give up some of its powers. Yeprem Khan, an ethnic Armenian, was an important figure of the Persian Constitutional Revolution. Armenian Apostolic theologian Malachia Ormanian, in his 1911 book on the Armenian Church, estimated that some 83,400 Armenians lived in Persia, of whom 81,000 were followers of the Apostolic Church, while 2,400 were Armenian Catholics. The Armenian population was distributed in the following regions: 40,400 in Azerbaijan, 31,000 in and around Isfahan, 7,000 in Kurdistan and Lorestan, and 5,000 in Tehran. In 1914 there were 230,000 Armenians in Iran. During the Armenian genocide about 50,000 Armenians fled the Ottoman Empire and took refuge in Persia. As a result of the Persian Campaign in northern Iran during World War I the Ottomans massacred 80,000 Armenians and 30,000 fled to the Russian Empire. The community experienced a political rejuvenation with the arrival of the exiled Dashnak (ARF) leadership from Russian Armenia in mid-1921; approximately 10,000 Armenian ARF party leaders, intellectuals, fighters, and their families crossed the Aras River and took refuge in Qajar Iran. This large influx of Armenians who were affiliated with the ARF also meant that the ARF would ensure its dominance over the other traditional Armenian parties of Persia, and by that the entire Iranian Armenian community, which was centered around the Armenian church. Further immigrants and refugees from the Soviet Union numbering nearly 30,000 continued to increase the Armenian community until 1933. Thus by 1930 there were approximately 200,000 Armenians in Iran. The modernization efforts of Reza Shah (1924–1941) and Mohammad Reza Shah (1941–1979) gave the Armenians ample opportunities for advancement, and Armenians gained important positions in the arts and sciences, economy and services sectors, mainly in Tehran, Tabriz, and Isfahan that became major centers for Armenians. From 1946-1949 about 20,000 Armenians left Iran for the Soviet Union and from 1962-1982 another 25,000 Armenians followed them to Soviet Armenia. By 1979, in the dawn of the Islamic Revolution, an estimated 250,000 - 300,000 Armenians were living in Iran. Armenian churches, schools, cultural centers, sports clubs and associations flourished and Armenians had their own senator and member of parliament, 300 churches and 500 schools and libraries served the needs of the community. Armenian presses published numerous books, journals, periodicals, and newspapers, the prominent one being the daily "Alik". Many Armenians served in the Iranian army, and many died in action during the Iran–Iraq War. Due to the war, the number of Iran's 250,000 Armenians further decreased to its current 150,000. Later Iranian governments have been much more accommodating and the Armenians continue to maintain their own schools, clubs, and churches. The fall of the Soviet Union, the common border with Armenia, and the Armeno-Iranian diplomatic and economic agreements have opened a new era for the Iranian Armenians. Iran remains one of Armenia's major trade partners, and the Iranian government has helped ease the hardships of Armenia caused by the blockade imposed by Azerbaijan and Turkey. This includes important consumer products, access to air travel, and energy sources (like petroleum and electricity). The remaining Armenian minority in the Islamic Republic of Iran is still the largest Christian community in the country, far ahead of Assyrians. The Armenians remain the most powerful religious minority in Iran. They are appointed five seats in the Iranian Parliament (the most within the Religious minority branch) and are the only minority with official Observing Status in the Guardian and Expediency Discernment Councils. Today in Iran there are about 120,000–150,000 Armenians left. Half of which live in the Tehran area. A quarter live in Isfahan, and the other quarter is concentrated in Northwestern Iran or Iranian Azerbaijan. The majority of Armenians live in the suburbs of Tehran, most notably Narmak, Majidiyeh, Nadershah, etc. Armenians are one of the indigenous people of Azarbaijan. Historically, the western and northern areas of Azarbaijan were part of Armenia. In 387 AD when the Sasanian Empire and the Byzantine Empire split Armenia, the historically Armenian areas of Nor Shirakan, Paytakaran, and the eastern half of Vaspurakan were ceded to the Persians, these territories comprise the western and northern regions of Azerbaijan. Following the Russo-Persian War (1826–28) about 40,000 Armenians left Azerbaijan and resettled in newly established Russian Armenia. The area retained a large Armenian population until 1914 when World War I began the Azerbaijan was invaded by the Ottomans who slaughtered much of the local Armenian population. Prior to the Ottoman invasion there were about 150,000 Armenians in Azerbaijan, 30,000 of them were in Tabriz. About 80,000 were massacred, 30,000 fled to Russian Armenia, and the other 10,000 fled the area of the modern West Azerbaijan Province and took refuge among the Armenians of Tabriz. After the war ended in 1918 the 10,000 refugees in Tabriz returned to their villages, but many resettles in Soviet Armenia in the later decades, currently about 4,000 Armenians remain in the countryside and about 2,000 remain in Tabriz. Salmas (Salmast in Armenian) now in Salmas County in West Azerbaijan Province: Kohneshahr, Akhtekhaneh, Aslanik, Charik, Drishk, Qalasar, Qezeljeh, Haftvan, Khosrowabad, Goluzan, Sheitanabad, Payajuk, Karabulagh, Hodar, Malham, Saramolk, Sarna, Savera, Zivajik, Kojamish and Ula. Urmia, Balanej, Badelbo, Surmanabad, Jamalabad, Gardabad, Ikiaghaj, Isalu, Karaguz, Nakhichevan Tepe, Reihanabad, Sepurghan, Karabagh, Adeh, Dizej Ala, Khan Babakhan, Kachilan, Shirabad, Charbakhsh, Chahar Gushan, Ballu, Darbarud, Kukia and Babarud. Khoy, Mahlazan, Ghris, Fanai, Dizeh, Qotur, Chors, Var and Saidabad. Maku, Qareh-Kelisa, Shaveran and Baron (Dzor Dzor). Vinaq, Ayenehlu, Garmanab, Lameh and Vayqan. Tabriz, Mujumbar, Sohrol, Aljamolk and Minavar. Upper Darashamb, Middle Darashamb and Lower Darashamb. Traditionally, Tabriz was the main city in Iranian Azerbaijan where Armenian political life vibrated from the early modern (Safavid) era and on. After the ceding of swaths of territories to Russia in the first quarter of the 19th century, the independent position of the Tabrizi Armenians was strengthened, as they gained immunities and concessions by Abbas Mirza. The particular importance of the Tabrizi Armenians also grew with the transfer of the bishop's seat from St.Taddeus (or Qara Kelissa) near Salmas to Tabriz in 1845. In 1604 and following years, during Ottoman-Persian War, about 500,000 Armenians forced to move from Nakhichevan, Vayots Dzor, Artashat, Yerevan, Armavir, Kotayk, Gegharkunik, Aragatsotn, Shirak, Lori, Tsolakert, Daroynk, and Kars to Central Iran as part of Shah Abbas I scorched earth policy. Many died crossing the Arax River, and those that survived the river crossing most likely perished while spending the winter in the mountains of Azarbaijan. About 200,000 Armenians were alive the following spring. 160,000 of them would resettle in central Iran and 40,000 of them would resettle in Farahabad in Mazandaran. The climate in the summer in Farahabad was unhealthy and large numbers of the inhabitants died of epidemics, particularly malaria. The surviving Armenians returned to their homes north of the Arax River. The Armenians that resettled in central Iran built hundreds of new villages. The Armenians of Julfa resettled along the Zayanderud and built the New Julfa quarter in Isfahan. Some also resettled in Hamadan, Qazvin and Shiraz. The non-Julfa Armenians that resettled in central Iran were resettled in the area that stretched from Qazvin and Hamadan in the north to Isfahan in the south. They built hundreds of villages in 12 rural clusters. Between 1722-1729 the Afghans invaded Iran and the Armenians of central Iran were subjugated, harassed, and heavily taxed. The Armenians were forced to provide the Afghan invaders with rations. From 1747-1762 Persia experienced a civil war following the assassination of Nader Shah Afshar in 1747. During the 18th century many Armenians were executed and abducted. As a result of these horrific years many 80% of the Armenian was lost, many fled for Russia, British India (Pakistan, India, Bangladesh, Burma), British Malaya (Malaysia & Singapore), and for the Dutch East Indies (Indonesia). In 1870 a famine ravaged Iran and 2 million people lost their lives. By 1914 there were only 80,000 Armenians in central Iran. Upper Chanakhchi, Lar, Charhad and Lower Chanakhchi. Malayer: Anuch, Deh Chaneh and Qaleh Fattahieh. Lilian, Qurchibash, Chartagh, Davudabad, Kandha, Darreh Shur, Mazra, Saki, Kajarestan and Mazraeh Qasem. Shapurabad, Khorzand, Parmishan, Pahra, Farajabad, Sang-e Sefid, Bahramabad, Dehnow, Qareh Kahriz, Nasrabad, Goran, Jowz, Cherbas, Jahan Khosh and Anuj. Azna, Ahmadabad, Perchestan, Kamian, Masoudabad, Abbasabad, Bagh Muri, Tokhmar and Sharafabad. Zarneh, Upper Khoygan, Nemagerd, Gharghan, Sangbaran, Hezar Jarib, Singerd, Lower Khoygan, Adegan, Hadan, Milagerd, Surshegan, Savaran, Chigan, Derakhtak, Punestan, Qaleh Khajeh, Aznavleh, Bijgerd, Khong, Moghandar, Nanadegan and Darreh Bid. Lenjan and Alenjan, now in Lenjan, Falavarjan and Mobarakeh counties in Isfahan Province: Khansarak, Kelisan, Mehregan, Pelart, Semsan, Kaleh Masih, Garkan, Zudan, Barchan, Jushan, Bondart, Koruj, Zazeran, Kapashan and Mamad. Charmahal or Gandoman: now in Borujen, Kiar, Lordegan and Shahr-e Kord counties in Chaharmahal and Bakhtiari Province: Vastegan, Geshnigan, Shalamzar, Gandoman, Sirak, Boldaji, Mamura, Mamuka, Hajiabad and Ahmadabad, Livasian and Zorigan. The settlements of Lenjan, Alenjan and Karvan were abandoned in the 18th century. The other settlements depopulated in the middle of the 20th century due to emigration to New Julfa, Teheran or Soviet Armenia (in 1945 and later in 1967). Currently only 1 village (Zarneh) in Peria is totally, and 4 other villages (Upper Khoygan, Gharghan, Nemagerd and Sangbaran) in Peria and 1 village (Upper Chanakhchi) in Gharaghan are partially settled by Armenians. Other than these settlements there is an Armenian village near Gorgan (Qoroq) which is settled by Armenians recently moved from Soviet territory. In addition to having their own churches and clubs, Armenians of Iran are one of the few linguistic minorities in Iran with their own schools. The Armenian language used in Iran holds a unique position in the usage of Armenian in the world, as most Armenians in the Diaspora use Western Armenian. However, Iranian Armenians speak an Eastern Armenian dialect that is very close to that used in Armenia, Georgia, and Russia. Iranian Armenians speak this dialect due in part to the fact that in 1604 much of the Armenian population in the Lake Van area, which used the eastern dialect, was displaced and sent to Isfahan by Shah Abbas. This also allowed for an older version to be preserved which uses classical Armenian orthography known as "Mashtotsian orthography" and spelling, whereas almost all other Eastern Armenian users (especially in the former Soviet Union) have adopted the reformed Armenian orthography which was applied in Soviet Armenia in the 1920s and continues in the present Republic of Armenia. This makes the Armenian language used in Iran and in the Armenian-Iranian media and publications unique, applying elements of both major Armenian language branches (pronunciation, grammar and language structure of Eastern Armenian and the spelling system of Western Armenian). ↑ "Armenian Iran history". Home.wanadoo.nl. Retrieved 2012-03-21. ↑ "Archived copy". Archived from the original on 2016-03-03. Retrieved 2015-10-23. ↑ M. Canard: Armīniya in Encyclopaedia of Islam, Leiden 1993. ↑ Trudy Ring; Noelle Watson; Paul Schellinger. Middle East and Africa: International Dictionary of Historic Places. Routledge. p. 268. 1 2 Amurian, A.; Kasheff, M. (1986). "ARMENIANS OF MODERN IRAN". Encyclopaedia Iranica. Retrieved 31 May 2016. 1 2 3 Arkun, Aram (1994). "DAŠNAK". Encyclopaedia Iranica. Retrieved 31 May 2016. ↑ Ormanian, Malachia (1911). Հայոց եկեղեցին և իր պատմութիւնը, վարդապետութիւնը, վարչութիւնը, բարեկարգութիւնը, արաողութիւնը, գրականութիւն, ու ներկայ կացութիւնը [The Church of Armenia: her history, doctrine, rule, discipline, liturgy, literature, and existing condition] (in Armenian). Constantinople. p. 266. ↑ Bournoutian, George (2002). A Concise History of the Armenian People: (from Ancient Times to the Present) (2 ed.). Mazda Publishers. ISBN 978-1568591414. ↑ "Assessment for Christians in Iran". Minorities At Risk Project. 2006. Retrieved 28 May 2016. ↑ Metz, Helen Chapin (1989). "Iran: a country study". Federal Research Division, Library of Congress: 96. Retrieved 28 May 2016. There were an estimated 300,000 Armenians in the country at the time of the Revolution in 1979. 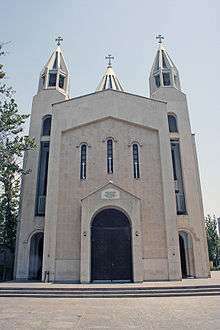 ↑ "Sarkis Cathedral, Tehran – Lonely Planet Travel Guide". Lonelyplanet.com. 2012-01-07. Retrieved 2012-03-21. ↑ "Iran's religious minorities waning despite own MPs". Bahai.uga.edu. 2000-02-16. Retrieved 2012-03-21. ↑ Golnaz Esfandiari (2004-12-23). "A Look At Iran's Christian Minority". Payvand. Retrieved 2012-03-21. ↑ "Իրանի Կրոնական Փոքրամասնություններ". Lragir.am. 2013-06-30. Retrieved 2013-07-06. ↑ Թամարա Վարդանյան. "Իրանահայ Համայնք. Ճամպրուկային Տրամադրություններ". Noravank.am. Retrieved 2013-07-06. ↑ Հայկական Հանրագիտարան. "Հայերն Իրանում". Encyclopedia.am. Retrieved 2013-07-06. ↑ "Edmon Armenian history". Home.wanadoo.nl. Retrieved 2012-03-21. Amurian, A.; Kasheff, M. (1986). "ARMENIANS OF MODERN IRAN". Encyclopaedia Iranica. Retrieved 28 May 2016. Berberian, Houri (2008). "ARMENIA ii. ARMENIAN WOMEN IN THE LATE 19TH- AND EARLY 20TH-CENTURY PERSIA". Encyclopaedia Iranica. Retrieved 28 May 2016. Wikimedia Commons has media related to Armenians in Iran.